On top of not developing a love of learning, I was certainly not learning much about life outside of school. I had few real relationships with my teachers. When it came time to think about college, I felt very intense pressure to go to a “good school,” but I did not understand why that was so important. My only “purpose” in going to high school was to get into the “right college”; it was something you had to get through in order to really start exploring your life in higher education. For less privileged classmates, high school was just a place to hang out for a few years before going out and getting a job. So how do we bring engagement, real-world learning, and a sense of meaning into high school education? Based on my own experience and what I have observed through visiting over 100 high schools during the past decade and teaching at six very different high schools—including elite private schools, traditional public schools, low-income charter schools, and a continuation school—I believe that the answer lies in developing a student’s passion and purpose. 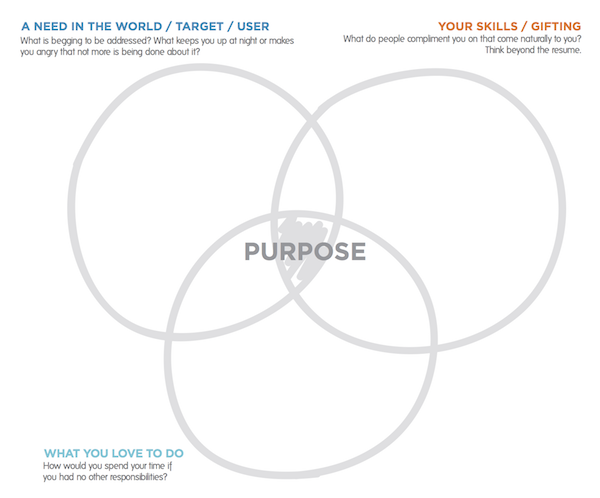 Lecturers at the Stanford’s d.school created the below graphic that identifies three interrelated factors essential to fostering purpose among students: 1) A student’s skills and strengths; 2) what the world needs; and 3) what the student loves to do. According to research by Kendall Cotton Bronk, a developmental psychologist at Claremont Graduate University, truly finding one’s purpose requires four key components: dedicated commitment, personal meaningfulness, goal directedness, and a vision larger than one’s self. These are not skills that typically get nurtured in American high schools today. Most of the high school experience is oriented around external achievement, checking off boxes, and short-term goal fulfillment. So what would a high school look like that helps students actively seek a sense of purpose? Based upon my experiences in the classroom—as a student and a teacher—and drawing on years of relevant research, below I lay out seven guiding principles that I would use in a purpose-learning curricula for high schoolers. In today’s schools, students compete against one another for grades and attention from teachers and colleges. The ranking system at most high schools sends the message to students that their worth is based entirely on their grade point average. This reinforces the notion that external achievement is the means to success and the way to get rewarded. But this is actually the opposite of what develops a sense of purpose: Students who show a sense of purpose have a deeply developed intrinsic motivation to achieve a goal or take part in an activity. This means they are not motivated to achieve something simply because they can, because it is hard, or because they get rewarded or recognized for it. Rather, they do it because they have a deep internal interest in pursuing it—and derive pleasure from the process. It is true that students need to be able to develop their skills and strengths in high school. But they also need to be able to find out what they love to do and what the world actually needs—and, quite often, students won’t receive external rewards when exploring these questions. Consider how different high school would feel if students were working in collaboration with their peers instead of competing against them all the time? What if high school grading was based on how well you worked with other people and how well you mentored and advised your peers? This would much more accurately mimic most workplaces, where teamwork and collaboration are some of the main skills desired by today’s employers. Part of developing a sense of purpose is having a vision bigger than one’s self. If you are only worried about yourself and your own advancement throughout high school—a mindset reinforced by today’s system—you’ll be trained to care only about yourself. By working in teams, our young people can start to develop the skills and mindsets that are essential both to thriving in today’s workforce and to leading a life that feels meaningful. What adult influenced you the most in high school? If you’re like most people, you’ll remember one of your mentors, coaches, or teachers who took a real interest in your well-being. People rarely mention someone who helped them cram things into their brain the most or taught them things they were not interested in. On the other side of the equation, if you talk to most high school teachers about what motivated them to become an educator, you will usually find it was about developing relationships. Choosing to teach or lead a school is not simply delivering content, but about helping young people find their way in the world. However, high school now is dominated by content delivery, leaving little room for teachers to develop meaningful relationships with students inside the classroom. At a high school I went to the other day, one of the students said that he had no meaningful relationships with any adults at the school. If you look at the research on those who have found their purpose, they often had at least three “Spark Coaches”—people who took an interest in their passions inside and outside of school. The Search Institute has documented the power of adult, non-parental mentors and role models in the lives of students. We need to create structures and cultures that allow students to develop these kinds of meaningful, mentoring relationships with teachers. And we need to make sure that teachers get trained as “spark coaches” to help their students find their passions and purposes. According to Bronk, students often start to develop a sense of purpose during “purpose seeking” opportunities—opportunities to push their comfort zones and explore. These opportunities have at least one of three active ingredients: an important life event, serving others in a meaningful way, or changes in life circumstances. This is why taking students outside the classroom can be hugely transformative for them, whether it’s a trip to a new place, a tough wilderness trip, or working on something important to them in their community—not doing it because they “have to” or simply for college admissions, but because they actually care about it. However, nearly all of high school currently takes place in a classroom. We need to expand the classroom out to the real world and actively include more purpose-seeking opportunities. Then we can bring those experiences back into the classroom, synthesize them with peers and teachers, and connect these activities directly to classroom material, making it relevant and engaging. 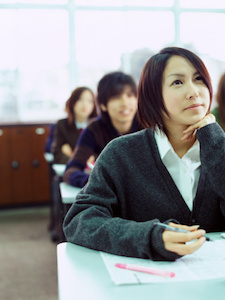 Our current model of high school rewards perfection and discourages risk taking. Students who are aiming for elite schools take the most number of classes where they can get the best grades and boost their GPAs. At some high schools, getting a single B can take them out of the running for prestigious colleges or awards at their school. Less academic students are shamed by getting bad grades. In other words, students are either rewarded for being perfectionists or shamed for failing. But failure is how we learn. Paul Tough documents this well—how learning to fail builds up critical life skills. It is hard to think of a political leader or anyone who ever accomplished anything important who did not fail along the way—in fact, failure was often a catalyst for their eventual success. Learning how to persevere is often the most important part of this process. But we do not give students the opportunity to fail without serious consequences. So when they get out into the real world they cannot deal with failure. Our traditional high school system completely neglects the inner lives of students. Often the most extensive part of the high school curriculum that touches on the inner lives of students is a semester-long health class (which is almost never taken seriously by high school students—just ask one). But by failing to nurture their internal lives, we risk knocking students from a path to purpose. There is something deeply spiritual about developing a sense of purpose. And it is no surprise that new research shows that teenagers with a greater sense of spirituality report higher levels of purpose and meaning. But our high schools do little to nurture this type of personal growth, and as a result we are creating a whole new generation of students who look great on the outside and hollow on the inside. To have a sense of purpose, it is essential that you know yourself: what you want from your life—not what others want for you, or what is expected of you—but what actually makes you come alive. If we deny our students the chance to really explore who they are, they lose out on their chance for purposefulness. Recently I shadowed a student at a high school who was part of a robotics club. He works very hard at the program and stays there through the weekends during competitions, but he does it out of passion and interest, not because he has to. This is the type of high school experience that everyone should have: where they have a chance to explore their passions, pursue them, and work hard to bring what they care about into the world. Want to help high schoolers find purpose? The GGSC's Purpose Challenge for students, educators, and parents incorporates cutting-edge science into videos and interactive exercises. Students can get help with their college essay and win scholarship awards. This article is printed here with permission. It originally appeared on Greater Good, the online magazine of the Greater Good Science Center (GGSC). 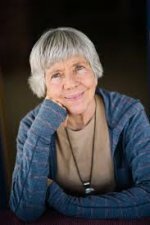 Based at UC Berkeley, the GGSC studies the psychology, sociology, and neuroscience of well-being, and teaches skills that foster a thriving, resilient, and compassionate society. Patrick Cook-Deegan is the founder and director of Project Wayfinder. Patrick was a 2015-2016 education innovation fellow at Stanford’s d.school, graduate of Brown University, and former Fulbright Scholar.